The working capital would be released at the end of 6-year period. The expected annual sales are 5,000 units of product. The discount rate of the company is 16%. 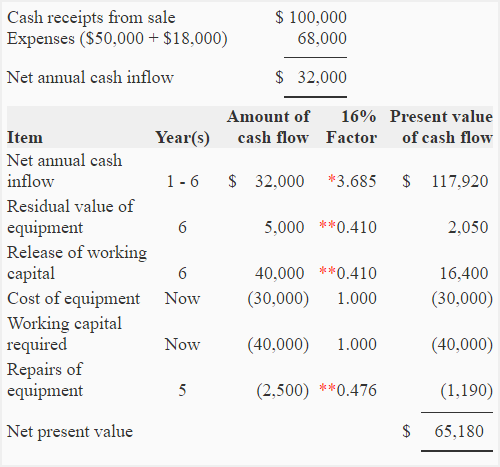 Compute net present value (NPV) of the new product. (Ignore income tax). Would you recommend the addition of new product? Yes, the addition of new product is recommended because its net present value (NPV) is positive. Most grateful.. this information makes my job as a new lecturer in agriculture management most rewarding. Would you be able to send me an e-copy of the topic please.